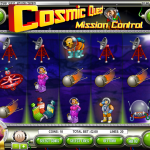 Cosmic Quest 1: Mission Control is a 5 reels / 20 paylines slot game released by Rival in 2008. As the name suggests this is part 1 out of a 2 episodes game and it is a galactic one too! What does that mean? well it can mean everything and if you’re a fan of Star Trek then you should know it. The game don’t take themselves too seriously and humor is an important part here. The Wild in this game is the Space Rocket symbol which will substitute other symbol to create a winning combination. 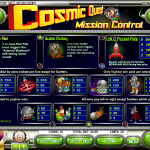 during free spins round it will also expand. There are also two scatters here. The first one is the Monkey Astronaut symbol. 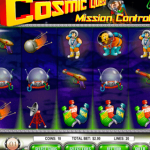 Landing 3 or more anywhere on the reels will reward you with 10 Free Spins. The second scatter is the Pink Pilot symbol. Landing 3 or more will trigger the Bonus Round in which you’ll be in charge of destroying asteroids. The more you manage to destroy the bigger the prize you will get. We like this game and we’re not exactly sure why. We’ve seen better than it on almost every aspect but only the fact that it is set in deep space and its casual vibe made it a really fun game for us. So many people are a true fans of bowling so the next game is for you: Bowled Over a 5 reel slot by Rival.